Freshwater biological water quality assessments have become an essential part of water resource management due to its effectiveness in determining the health of a body of water. 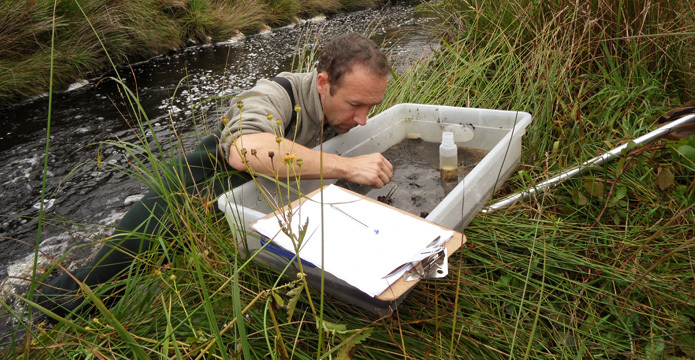 ECOFACT undertakes freshwater biological water quality assessments, where the presence of indicator species are calculated against a number of standard biotic indices in order to provide a baseline biological water quality rating for a watercourse. ECOFACT maintains technical expertise in a range of specialist aquatic survey methodologies and taxonomic identification. Freshwater sampling data collected by ECOFACT is measured in terms of compliance with the EU Water Framework Directive (2000/60/EEC) with respect to ecological status for projects that may potentially affect surface waters through construction impacts or licensed discharges / abstractions. We also undertake Functional Feeding Group (FFG) analysis which can detect more subtle changes in the aquatic community structure than would be apparent from biotic indices. Biological water quality surveys undertaken by ECOFACT are a rapid and cost-effective service, providing accurate and robust data on the aquatic environment. Samples are processed to the required standards following the EPA methodologies, while applied aspects of macroinvertebrate ecology are also offered by ECOFACT in order to provide a high resolution insight into the ecology of a waterbody. This provides greater confidence in the results of any aquatic sampling exercise. In-house quality control ensures each project receives individual attention from the approved sampling methodology on site through to the sample processing and logging of data. Samples are stored and archived to ensure a consistent, high quality service is offered every time.